We are proud to announce the release of version 0.98 of the modeling tool. This version has been in the making for over one year, and is already used in production for a number of data warehouses and system databases. The graphical interface, while retaining the look and feel, has been completely rewritten in animated SVG, which has improved performance and usability over the old canvas implementation. This step was necessary in order to make it easier to extend the tool graphically. The test version, now at 0.99, will make use of this in order to add support for visualising natural keys. A number of changes have also been made to the triggers, utilising nested triggers in order to reduce the size of a single trigger. Remember to disable triggers before doing inserts directly into attribute tables when you use ETL tools, rather than the triggers on the latest view. The test version has already been given a number of fixes, primarily to align it with the current research in Anchor modeling. Among these are decisiveness, which controls whether a positor may hold multiple beliefs at a given point in bitemporal time, or if only a single belief is possible (which is the default behaviour). We created the Iceberg Exercise in order to demonstrate a business case in which all features of Anchor modeling could be showcased. It has been presented at a number of conferences, but the actual model and example data with queries had not been published online. These are now made publicly available along with an explanatory video tutorial. The model below captures most of the requirements given in the documentation of an Iceberg Tracking and Drift Prediction System. Icebergs have attached transmitters in order to keep track of their location. Icebergs may split or merge during their lifetime and enters or exits certain geographical areas. Icebergs and transmitters have a number of attributes, some of which may change over time. The model is concurrent-reliance-temporal in order to capture concurrent, but maybe conflicting, views of an iceberg, such as sightings from passing boats. After generating the SQL code that creates an implementation of the model, the following script for Microsoft SQL Server, used in the tutorial, can be run in order to create some example data and run some illustrative queries. The script has been extended to show some other features as well. With the help of Nikolay Golov (avito.ru) support for generating unitemporal Vertica implementations have been added to the test version of the online modeling tool. Vertica is an MPP columnar database, and Avito runs a cluster of 12 nodes with 50TB of data in an Anchor model. A relational Big Data solution that outperforms previously tested NoSQL alternatives! In Vertica there are three distribution models, and they happen to coincide with Anchor modeling constructs. The data is available locally (duplicated) on every node in the cluster. This suits knots very well, since they may be joined from both ties and attributes anywhere. The data is split according to some operation across the nodes. For example, a modulo operation on the identity column in the anchor and the attribute tables could be used to determine on which node data should end up. This keeps an instance of an entity and its history of changes together on the same node. Data necessary in order to do a cross-node join is stored across the nodes, for all directions of the join. Ties fit this purpose perfectly and does not introduce any overhead thanks to only containing the columns on which joins are done. Anchor modeling fits MPP extremely well, since the constructs are designed in such a way that the MPP is utilized as efficiently as possible. A knotted attribute or tie can be resolved locally on a node, and a join over a tie cannot be more efficient, while the assembly of the results from different nodes is trivial. Incidentally, if you search about issues in Vertica, implementations may suffer from having to create lots of projections or broadcasts of wide tables in order to support ad-hoc querying. This is a natural result of using less normalized models. Anchor modeling, on the contrary, works “out of the box” for ad-hoc querying. Furthermore, what should be projected and broadcast is known beforehand, and not tuning work a DBA would have to worry about on a daily basis. Since Vertica does not have table valued functions or stored procedures, only create table statements are generated so far. We are still working on providing some form of latest views. Thanks to the tremendous efforts of Elari Saal we are ready to test unitemporal PostgreSQL support. It is available in the test version of the online modeling tool. Please report any bugs you find on the github page for the PostgreSQL branch, leave comments to this post, or use the forums. The test version of the tool is now hosted by github, which gives us much better control over deployment. Please update any old links you may have to the previous host (anchor.co.nf). We are proud to announce the second public Anchor Modeling Certification Course, to be held in Stockholm on June 24th to 26th. Please see the details below for how to sign up for the course and the included certification. The course is held in central Stockholm, and we can help recommend accommodation for foreign participants. Duration: 2 days of lectures and workshops followed by ½ day of assisted examination. Location: Stockholm, Sweden, hosted by UpToChange (www.uptochange.com). Date: June 24th to 26th, 2015. Please register before the 10th of June. 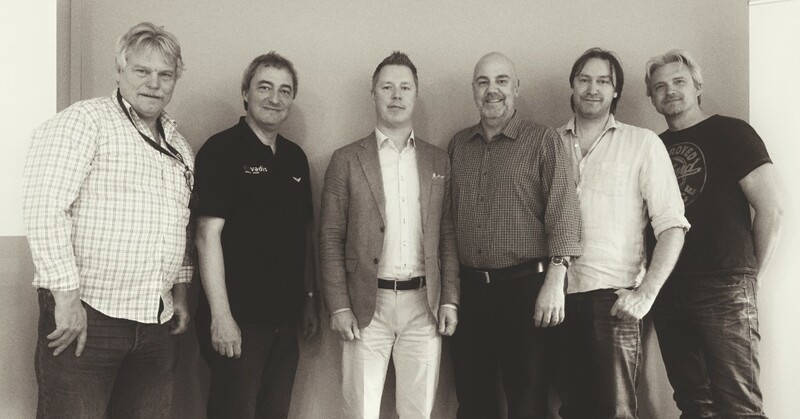 Target Audience: Data Modelers, Enterprise Architects, Data Warehouse Architects, Business Intelligence Architects. A prerequisite for the class is to have a general familiarity with and understanding of database modeling concepts. Certification Validity: Your certification will get a version number, specifying which version of the certification you took. A certification of a certain version is valid for life. If and when enough things have changed in Anchor Modeling to warrant a new version of the certification, the version number will be increased and people can decide if they want to recertify for the new version or not. Course Description: The course will cover both uni-temporal (the original) and concurrent-reliance-temporal Anchor Modeling from theoretical and practical points of view, with students building their own models using our modeling tool as exercises. After the course and certification you will be equipped with the knowledge necessary to architect your own solutions using Anchor Modeling. The course will introduce bitemporal concepts used to handle versioning and corrections of information, while retaining a complete history of such changes. The reliability of information and how such can be used to solve otherwise difficult modeling challenges is discussed, and introduced in one of the exercises. Storing concurrent and opposing views of the same information but with different origins is also handled. The course will also demonstrate how “time traveling” is possible through the use of parametrized views, making it possible to ask complex temporal questions through simple SQL, and how these queries gain excellent performance thanks to modern query optimization techniques. Other advanced topics in Anchor Modeling, such as evolving models over time, design patterns, refactoring, and management of unknown values are handled in the course. Background: Anchor Modeling is an agile modeling technique particularly suited for data environments that change over time. It has been developed in a collaboration between the Swedish industry and the Dept. of Computer Science at Stockholm University. With ten years since the first implementations, along with awarded Open Source tools and scientific papers, the technique has gained world wide momentum. Anchor Modeling can be implemented in traditional relational databases and it is based on current research in entity relationship modeling, database normalization and temporal databases. 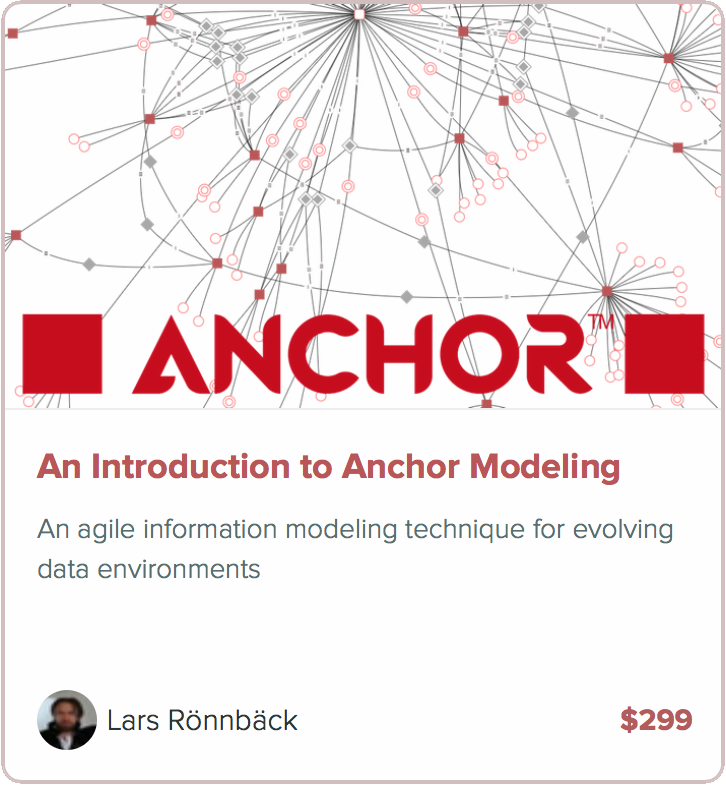 About the instructor: Lars Rönnbäck is one of the authors of the Anchor Modeling technique. He is working as a senior consultant at UpToChange and is a research affiliate with Stockholm University. He has been working with some of the largest companies in the Swedish insurance and retail businesses, is an avid presenter at conferences, and has more than ten years experience from the field of Business Intelligence. We will be submitting a paper for the 34th International Conference on Conceptual Modeling (ER 2015) October 19-22, in Stockholm, Sweden. We will also submit a request for a demo station where we will be showing the online modeling tool to participants. This is one of the most respected conferences on data modeling within the academic world. The father of the Entity-Relationship model, Peter Chen, has been involved in the conference from the start. The first conference was held back in 1979 and it has been around the world several times since then. For example, we won the best paper award for Anchor modeling in 2009, when it was held in Brazil. Don’t miss this opportunity to participate! It’s not too late to submit interesting topics for papers, tutorials, demos, and more, or just be a visitor to gain insight into the very latest research. We hope to see you there! On September 28-29, 2015, we will be in Hamburg, Germany to talk about Anchor modeling at Data Modeling Zone. There will be an intro to Anchor modeling aimed at those who do not know it yet, but it will be based on the very latest research we have done, so we would also recommend it to those who are already familiar with Anchor. For those who want a bit more depth there will also be an advanced half day workshop, where we look into a case that concurrent-reliance-temporal modeling beautifully solves. Finally, we will also be taking part in a panel discussion about the future of data modeling! We are really excited to be on the road again. There are some exciting news we would like to share with you at the conference as well. Like talking about a 40TB implementation that replaced a NoSQL solution, with significantly better performance for both loading and querying. There are also a couple of Open Source efforts. One being PostgreSQL support for the tool and the other a metadata driven data warehouse ETL and automation framework for loading Anchor models. Finally, there is also a scientific paper on its way that dives into the theory behind concurrent-reliance-temporal Anchor modeling. If you have specific questions, there’s always the chance to grab us between or after sessions. Let us know in advance, though, if possible!